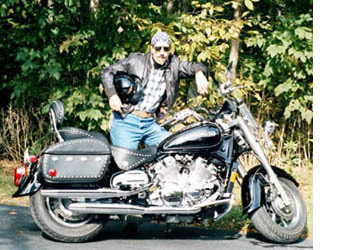 Steve Mango says, "She's a '98 Boulevard, black & chrome. I rescued her in August Y2K from a showroom where she had languished for almost a year, with 2,500 miles on the odometer. She's still very young, with only 13K miles. Mechanically, she's pure stock, but as you can see I've added some Yammy accessories and transformed her into a Tour Classic. She doesn't have a name... we just have an understanding, and respond to each other. I wish the upstate NY (Honeoye Falls) weather would allow us more time together, but I'll settle for April through October."